I traveled to Tokyo and Beijing with the “East Asia: Foreign Policy, Trade and Security” class, co-lead by MIIS faculty Professor Tsuneo Akaha and Professor Wei Liang, and accompanied by my two colleagues Hirofumi Jinno (MATI ’15) and Lisa Huang (MACI ’15). Two reasons motivated me to join the trip. As a Chinese native, the bizarre relationship between Beijing and Tokyo intrigues me: I was an eye-witness to the 2012 anti-Japanese vandalism; but as an avid animation lover, I also have a personal understanding of the huge presence of Japanese culture. These mixed feelings and experiences compelled me to go there and see for myself. The comparative learning opportunity presented itself as the best way to look at the China-Japan relationship through an academic lens, free of political tirades and media rhetoric. On top of that, as I am about to finish a two-year degree in Conference Interpretation, and I decided that it was time to put my skills to test after many hours of practice in the booth. The trip enhanced my learning experience at MIIS in three ways. First, it consolidated my interpretation skills. During our four days, Lisha and I, equipped with portable devices thanks to GSTILE’s generous support, provided whispering, consecutive and simultaneous interpretation totaling 8 solid hours. It pushed me to my limit, yet introduced me to a range of the most relevant topics in East Asia. I received feedback from my six dependent audience members and built up my stamina. When in Tokyo, I also had the opportunity to watch and learn from my Japanese colleague, Hirofumi Jinno while he worked—it was very interesting to observe how culture shapes the codes of interpreters. Second, the trip as well as the seminar have also deepened my understanding of regional affairs. In order to familiarize myself with the topics prior to the trip, I took the class with two IPS credits, finished the reading and put together a glossary for each topic. Thanks to the broad connections of Professors Akaha and Liang, we were received by policy-makers (e.g. the Director of the International Trade Research Institute, MOFCOM) and scholars (Peking University, Renmin University and my alma mater Beijing Foreign Studies University) who I had never thought of interpreting for as a novice interpreter. The interpretation assignments covered a broad range of the most up-to-date topics including politics (US pivot towards Asia, Chinese and Japanese foreign policymaking, China and Japan’s perception of each other, of Korea and of ASEAN, China’s soft power), security (disputed islands in South China Sea and East China Sea, US-Japan alliance), trade and economics (Japanese companies and investment in China, China’s economic diplomacy and FTA negotiations in East Asia) and history (the fundamental issues in China-Japan relationship). Third, the trip came with an unexpected networking bonanza. We were invited to a grand reunion of MIIS graduates in Beijing hosted by Kai Zhang (TESL’10). Several GSTILE graduates who now work as full-time interpreters kindly shared with me their working experience and advice. With my commencement around the corner, I feel reassured to know that the MIIS Mafia has a strong presence, and to learn the names of some of the people that I should talk to when I start freelancing in the largest interpretation market in China. The trip was an example of perfect interdisciplinary cooperation between IPS and GSTILE. I made myself a useful addition by facilitating smooth communications thanks to previous training at MIIS. After greeting our guest speakers, Prof. Liang would remind them that simultaneous interpretation was provided by MIIS CI students, and that they were free to speak Chinese. On the one hand, this enabled the lectures to expound on their ideas and speak their minds more freely; on the other hand, it saved participants precious time for more discussion, which would have to be shortened by half without simultaneous interpretation. It was an educational experience on both sides. I was introduced to a wide range of topics, and my fellow IPS students learned how to work with interpreters who will surely be part of their future professional life. It also came as a confidence booster, as this was my first interpretation assignment out in the field. I was able to carry messages across language barriers without major meaning errors, and impressed we our hosts with our professionalism. The interpretation trip would not have been half as successful without the generous support of GSTILE. Our hosts in Beijing were surprised enough to receive a graduate students’ group bringing with their own interpreters; they were even more impressed when they found out that we came equipped with the best portable devices in the market. If outsiders’ amazement was not convincing enough, I overheard a conversation between an interpretation program coordinator who was invited to speak at the Monterey Forum, with our interpretation practicum professor Laura Burian. He was a little surprised to find that student interpreters at MIIS are allowed to handle portable devices (transmitters and receivers). I bet he would drop his jaw had he known that I was allowed, or rather, encouraged by the ever-supportive GSTILE to travel with 10 receivers, 1 transmitter and 1 microphone on an overseas trip that lasted 12 days. Before my departure, Angie Queensberry helped me pack the devices with foams and loaded me with packets of batteries just to be sure we would have them. Prof. Burian took the initiative to draft an English supporting document explaining what the equipment was for and asking for assistance at customs. The Japanese version was readily prepared by my colleague, Hirofumi Jinno and proofread by Prof. Tsuneo Akaha; while the Chinese version was translated by myself and proofread by Prof. Burian. Of course, all the paperwork was made valid by the approval of Dean Renee Jourdenais who was there for us all the time. Everyone that I have come across in this trip has proved themselves to be a follower of our motto “Be the solution”. This entry was posted in Uncategorized on March 31, 2015 by Angela Quesenberry. 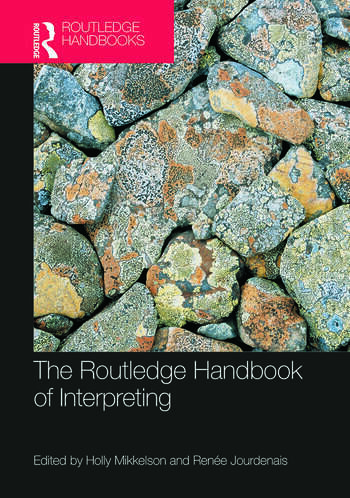 New Routledge Handbook of Interpreting Published! The newly published Routledge Handbook of Interpreting was edited by MIIS Professor Holly Mikkelson, and GSTILE Dean Renée Jourdenais. The Handbook also includes articles from MIIS Professors Chuanyun Bao, Wallace Chen, Jean Turner, and other MIIS alumni and former faculty! You can see the table of contents and learn more about the book here. This entry was posted in Uncategorized on March 24, 2015 by Angela Quesenberry.